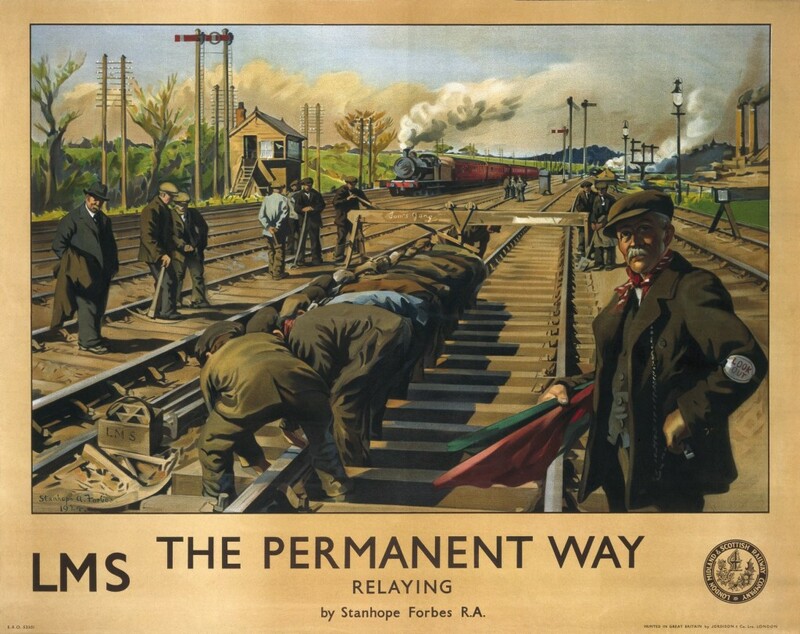 Poster produced by London Midland & Scottish Railway (LMS) showing engineers laying track. The poster is intended to draw attention to the good riding quality of the railway’s track. Artwork by Stanhope Alexander Forbes, who studied at the Lambeth School of Art, the Royal Academy Schools and under Bonnat in Paris. He painted landscapes, town and coastal scenes as well as figures, mainly in oil. He founded the Newlyn School of Art with his wife Elizabeth Adela Armstrong in 1899. He exhibited at the Royal Academy and was one of the Academicians commissioned by the London Midland & Scottish Railway (LMS) in 1924. Agreements on markets and prices of rails marked the start of transnational cartels in Europe. Once the expansion of European railway lines largely came to a halt in the late nineteenth century, the market became mostly limited to rails produced for replacing old tracks, as in the case of the works in this image.